Body: Very athletic, strong. Slender build with chance to grow without losing speed, athleticism. Strong hands/wrists. Hit: Quick, loose hands. Lunges a bit, especially on off-speed. Big swings early in the count. Eye at the plate is mature for age. Will expand zone on sliders away. Struggles a bit with premium velocity, especially up in the zone. Swing has tendency to get long. Swings early and often and is fooled by spin. Does not look to work count. With 2 strikes, will keep hands back and tones down swing in order to make contact. Has the speed to leg out infield hits, boosting batting average. 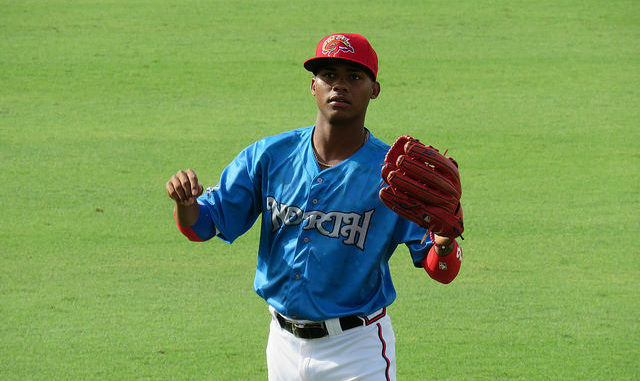 Overall: Pache’s main tools are his Gold Glove defense and plus arm and speed. He has the bat speed and athleticism to become an everyday CF with potential for 20 HR 30 SB, which would make him a perennial All-Star. At the plate, Pache will need to temper his aggressiveness and shorten his swing, utilizing RCF, to maximize his potential. He is able to shorten up with two strikes and avoid high K rates but he lacks consistent hard contact overall. Batting average is boosted by elite speed as he tends to hit more soft ground balls with two strikes. Due to his aggressiveness, Pache tends to get out on to his front foot too quickly, causing his swing to lengthen. Moderate Risk due to defense and speed. There is some commentary a bit after a minute in the video probably needs to be edited out.